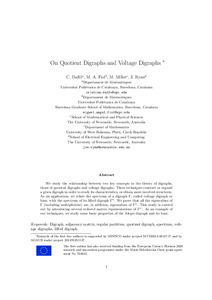 We study the relationship between two key concepts in the theory of (di)graphs: the quotient digraph, and the lift Ga of a base (voltage) digraph. These techniques contract or expand a given digraph in order to study its characteristics, or obtain more involved structures. This study is carried out by introducing a quotient-like matrix, with complex polynomial entries, which fully represents Ga. In particular, such a matrix gives the quotient matrix of a regular partition of Ga, and when the involved group is Abelian, it completely determines the spectrum of Ga. As some examples of our techniques, we study some basic properties of the Alegre digraph. In addition we completely characterize the spectrum of a new family of digraphs, which contains the generalized Petersen graphs, and that of the Hoffman-Singleton graph. We study the relationship between two key concepts in the theory of digraphs, those of quotient digraphs and voltage digraphs. These techniques contract or expand a given digraph in order to study its characteristics,or to obtain more involved structures. As an application, we relate the spectrum of a digraph Γ, called a voltage digraph or base, with the spectrum of its lifted digraph Γα. We prove that all the eigenvalues of Γ (including multiplicities) are, in addition, eigenvalues of Γα. This study is carried out by introducing several reduced matrix representations of Γα. As an example of our techniques, we study some basic properties of the Alegre digraph and its base.